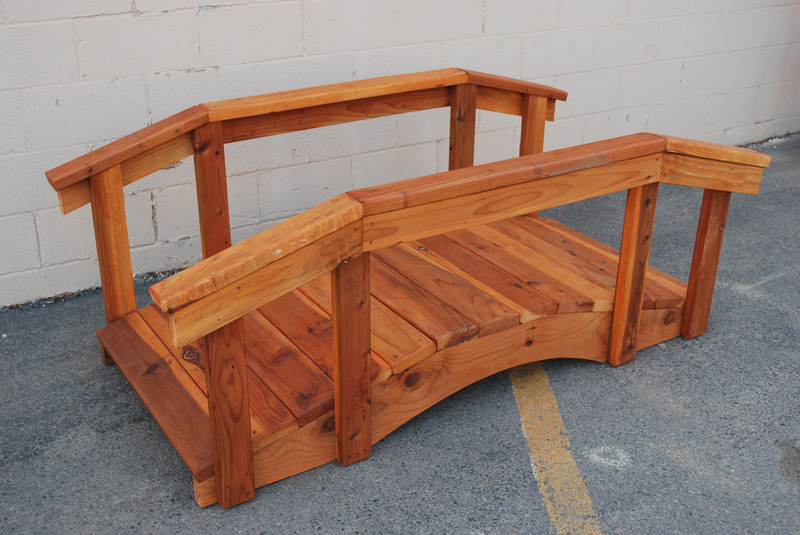 Our sturdy and functional bridges add a beautiful focal point and distinctive impact to your outdoor space. They can be placed over any landscaping feature such as a dry creek bed, a flowing stream or simply incorporate them into a flower garden. We offer 2 lengths of bridges, 6' or 8'. The 6' bridge has a 34" opening and rises almost 11". The 8' bridge has a 40" opening and rises almost 12". The bridges are available with 3 rail styles including a 17" knee high rail, a 32" hand height rail, or no rail (please comply with your local building codes). Vines can grow up the handrails to add to the organic feel while the wood remains strong and resilient. Redwood resists decay when directly on the ground. Our bridges are designed and hand built at our store in Northern New Mexico. Beautiful and functional, our bridges are designed for timeless style and durability. Both bridges use 2" x 6" redwood decking. The 6' bridge is built with 2" x 10" redwood sides, the 8' is built with 2" x 12" redwood sides and both are assembled with zinc coated screws for added strength and durability. Visit our friendly, family-owned showroom. We load your purchase in your vehicle and offer delivery throughout the Four Corners area. ?? ?Due to their size, bridges are In-Store products??? Call for local pricing.